11 April 1982 in Augustown, Jamaica. Ma Taffy may be blind, but she sees everything. So, when her great-nephew Kaia comes home from school in tears, what she senses sends a deep fear running through her. While they wait for his mama to come home from work, Ma Taffy recalls the story of the flying preacherman and a great thing that did not happen. Augustown is a story within a story. There’s what’s happening in the present with Ma Taffy and Kaia, her story of the flying preacherman, and an almost omnipresent narrator that’s looking down on the events that are unfolding and can see the past and future. There are also other characters who live in Augstown that come in and out of the story at different times, and it’s as the story progresses that you can see all these connections between them. Augustown is a story all about the divide in Jamaican society and how people may try and fail to bridge that divide and perhaps better themselves. There’s rich vs poor, white vs black, Babylon vs Rasta. All these differences and divisions come to a head when Kaia comes home crying after his teacher cuts off his dreadlocks. It’s a shocking thing for the young boy and the community as a whole, and soon the people start to get involved. The writing style is almost poetic at times as it paints a vivid picture of life in Jamaica in the twentieth century. The stark differences between what the poor Augstown looks like and the rich areas of Jamaica that are in the hills and look down upon Augustown look like are clear. Also, the attitudes between the people who live in the two different areas is realised through the few times when people from each of these worlds interact. There’s talk of code-switching, how someone changes their dialect or use of slang depending on who they’re talking to, and of what opportunities are available to different people. Augustown is a quick read with engaging themes but unfortunately while I did feel sympathy towards many of the characters, I was never fully drawn into their story. 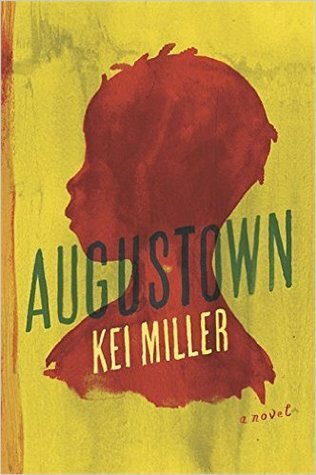 How Augustown shows the divisions of class in Jamaica is eye-opening and it shows how one person’s actions can have ramifications they couldn’t have expected. Alphonse is a friendly and observant former musician, who has left Brussels with his girlfriend Cat to live closer to her parents in the rural district of Westhoek. It’s a place that has open fields and more World War I graves than almost anywhere else in Europe. Alphonse starts a new life as a painter and decorator, and he becomes entwined in so many peoples lives. But when he, Cat and one of his clients help a group of Afghans and Syrians at a makeshift refugee camp, he learns that not all of the locals appreciate what they’re doing. Somewhat surprisingly the first chapter in Thirty Days is chapter 30, and each chapter number decreases. While it’s a slow book to get going, this adds to the fact that the story appears to be building to something – and it certainly does build to something unexpected. Plus, like the title suggests, it each chapter is a day, something I didn’t register to begin with. I really liked Alphonse, but I could see why his partner Cat would get frustrated with him. He’s a painter and decorator so he goes to various people’s homes to do a job but there’s something about him that causes his clients to offload a lot of their thoughts or secrets on him. He becomes involved in so many people’s lives and Cat doesn’t always like that as it takes his time and thoughts away from her and their life together. He’s a guy that’s almost too nice for his own good but his niceness is never off-putting or eyeroll-inducing. Alphonse is victim to a lot of racism ranging from micro aggressions, being asked where he’s really from after first saying Brussels, to full on hostility, such as when a client’s neighbour accuses him of trying to break into their house. As Thirty Days is from Alphonse’s point of view, it never stops and describes how he or Cat look like, so you get to know him without any preconceptions meaning when he does experience racism it’s more of a shock and an interesting way of presenting what he faces. Surprisingly, Alphonse doesn’t encounter the refugee camp until the last third of the book. Instead, the clients he has and his relationships with them, and his girlfriend and their friends and family, is the main focus of a lot of this story. 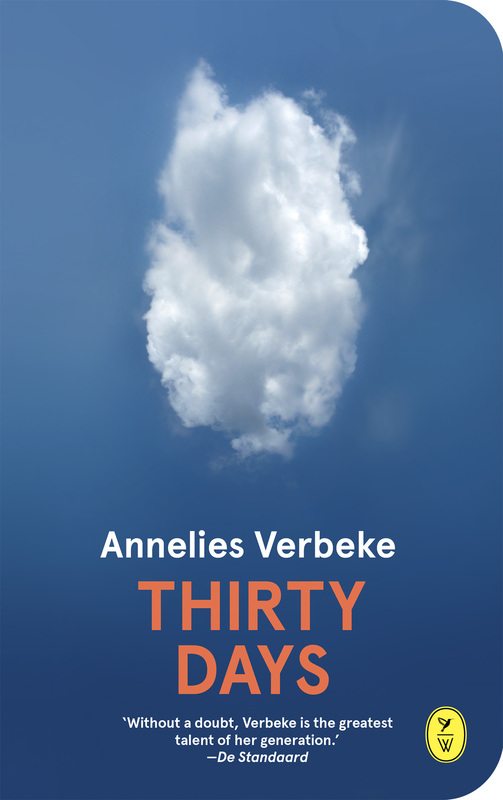 Thirty Days is beautifully written and it’s a moving story. The themes of being a good person, helping others but still making sure you don’t give up all of yourself are all handled well. As is both the underlying and overt racism Alphonse experiences, in every day life, and when he tries to help refugees who are just looking for somewhere to call home. It deals with so many opposites, good and evil, beauty and ugliness but it never feels preachy. Thirty Days is a compelling story and I devoured the last few chapters as I just had to know where things were going for Alphonse. 5/5. Abbas has never told anyone about his childhood and his life before he was a sailor, before he met his wife Maryam outside a Boots in Exeter and they made a quiet life for themselves in Norwich with their children, Jamal and Hanna. At the age of sixty-three, Abbas collapses and is left bedbound and unable to do speak about the secrets of his past. Abbas’s illness forces his children home, Hanna who calls herself Anna now and is moving to a new city with her boyfriend, and Jamal, a quiet university student who is captivated by a young woman in his shared student house. There they have to deal with their father’s silences and their fretful mother as their parents’ pasts are revealed. 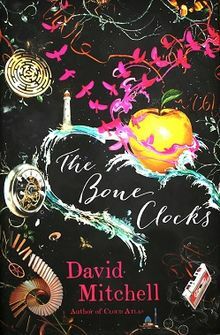 I listened to the audiobook narrated by Lyndam Gregory and it took me a while into the story because of his narration, I just didn’t really take to it straight away. The Last Gift is told from the perspectives of each family member with each chapter having a section of the story from each character. The exposition at the beginning of the novel is blended almost seamlessly with the action. Abbas collapses at the very beginning of the story and as he does so, it’s like his life flashes before his eyes, allowing the reader to get a sense of who he is. It’s not until he is recuperating that he begins to think about his childhood and adolescence, and the reasons why he left Zanzibar, for the first time in decades after keeping the guilt and memories buried for so long. His revelations shock his wife and children and they each deal with it differently. 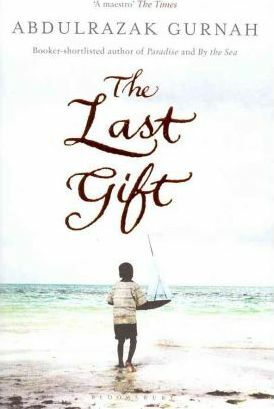 The Last Gift is a story about immigrants, their children, and the struggle to find an identity. Maryam doesn’t know who her parents were and grew up with different foster families. She has dark skin and as a child was bullied and didn’t feel like she fit in. She’s not confident in herself and has relied on Abbas to deal with money and bills, so when he falls ill she has a whole new world of responsibilities to navigate. As Abbas had previously only told his family he was from East Africa when they asked, and Maryam has no idea of her heritage, Hanna and Jamal have never really known what their family heritage is. When they are faced with some unexpected knowledge of it, Hanna doesn’t want to be a part of a “vile immigrant tragedy” while Jamal is keen to find out more. The Last Gift is about stories and memories, and how not everyone wants to hear them and face up to the truth of them. Most of the characters are nuanced, Hanna especially is equal parts unlikable and sympathetic, and while some of them get some closure, others are left as uncertain of their place in the world as when the book began. 4/5. Welcome to this very late unboxing of the ‘Journeys’ Summer Reading Box! I received this exciting package two weeks ago today, but due to work being super busy and life in general being a bit hectic, I didn’t have a chance to write this post until now. Ninja Book Box is a UK-based quarterly book subscription box that’s all about sharing independently published books. There’s different genres every quarter and some goodies included too. Ninja Book Box also runs a monthly book club for independently published books and anyone can vote for the next months book which is pretty cool too. They are opening their own online second-hand independent books bookshop very soon as well! The fabulous brain behind Ninja Book Box never stops. Now onto the books. I bought the ‘Journeys’ Summer Reading Box. 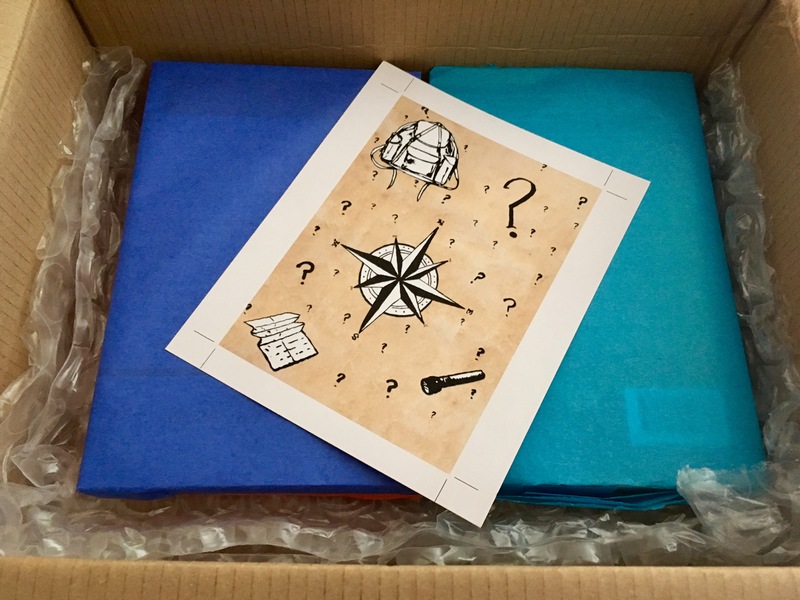 This is the second year Ninja Book Box has done a summer reading box and it focuses on the books, not the goodies – though there were some nice surprises in here! Each book was individually wrapped in tissue paper which is a nice touch. The first book I unwrapped was The Last Pilot by Benjamin Johncock – I love the cover of this book, it’s beautiful. The story sounds great too as it starts off in the late 1940s with US Air Force test pilots racing to break the sound barrier. By the 1960s the space race is in full swing and Jim Harrison and his colleagues are offered the chance to be the world’s first astronauts. But when his young family is thrown into crisis, Jim must decide whether to accept his ticket to the moon, and if he does, what will it cost. I’m intrigued to see how much of this book is fact and how much is fiction. I do enjoy historical novels that blend the two together, and the space race is always interesting! There was an interview with the author included as well. The next book I unwrapped was The Red Beach Hut by Lynn Michell and it was signed which is always a bonus. The Red Beach Hut is about eight-year-old Neville and Abbott, a man who’s on the run after panicking over what he believes to be a homophobic cyber-attack. Abbott takes refuge in the red beach hut, and slowly he and Neville form a friendship, but Abbott’s past threatens to tear him away as others interpret his and Neville’s friendship in their own ways. This is a relatively short book and it sounds like a poignant story. 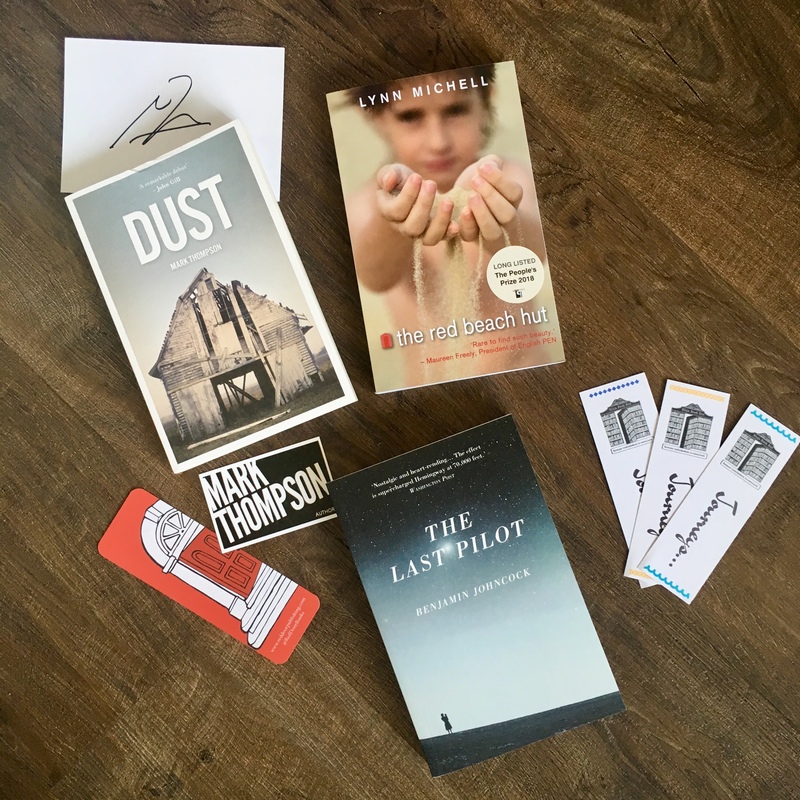 And finally, the last book was Dust by Mark Thompson which came with a signed bookplate, a bookmark and an interview with the author. The story follows J.J Walsh and Tony ‘El Greco’ Papadakis, two inseparable friends in one formative summer in the 1960s. They face religious piety, alcohol, girls, and tragedy but it’s a road trip through the heart of southern America that shows a darker side to life. It shows the divided nation where wealth, poverty and racial bigotry collide. All three books sound compelling in their own ways, and while The Last Pilot is the sort of book I’d pick up if I saw it in a bookshop, the other two aren’t. That’s what I love about subscription boxes like Ninja Book Box, it gives me the push to try something a little out of my comfort zone. I really like how all three books definitely fit in with the theme of “Journeys” – whether it’s a physical journey across the country or into space, or an emotional one. I’m looking forward to reading how all these journeys unfold. Make sure you check out Ninja Book Box’s website and their various social media channels, especially Twitter, so you can keep up with all their bookish news. And if you like the sound of these books and fancy getting them for yourself, there’s a few Summer Reading Boxes still for sale here. Thanks to her grandmother, Claire Bixby grew up watching Doris Day films and fell in love with the world on the screen – the sunny, colourful world where happy endings always happen. But Claire’s been lacking any romance in her life for quite a while. That is until Nic comes into her travel agency looking to book the perfect holiday. Pity it’s for two! But as Nic and Claire get closer and the sparks start to fly, Claire begins to question everything Doris taught her about romance. Claire’s a pretty relatable character and even though she still believes in happily ever after’s, she’s not naïve and she’s willing to work for what she wants. Nic is a bit frustrating at times. It’s been ages since I’ve read a romance novel where it’s the man who is the source of the miscommunication and keeps digging himself a hole. So often it’s the woman who keeps making mistakes but this time it’s Nic that doesn’t seem to know when to stop talking. 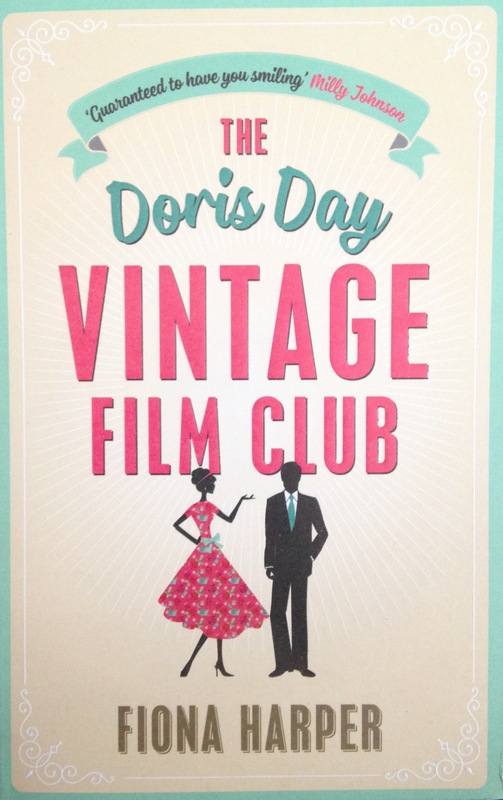 The Doris Day Vintage Film Club is a sweet read with some lovely friendships between women. Really it’s these friendships that are the highlight of the book. Those who attend the Doris Day Vintage Film Club are all ages and from all backgrounds so you wouldn’t normally expect to see them together. It’s nice to see women become friends over a mutual passion and who like to help each other out. The Doris Day Vintage Film Club is a nice story. There’s nothing too memorable about it but it’s still a sweet read with nice characters and it manages to not be too predictable. And if one thing is for certain, The Doris Day Vintage Film Club has made me want to watch Doris Day’s filmography. 3/5.